• Have impressive intellectual abilities but seem puzzled by ordinary interactions with other children? • Have deep, all-absorbing interests or seemingly encyclopedic knowledge of certain subjects? • Bring home mediocre report cards, or seem disengaged at school, despite his or her obvious intelligence? If you answered "yes" to these questions, this book is for you. 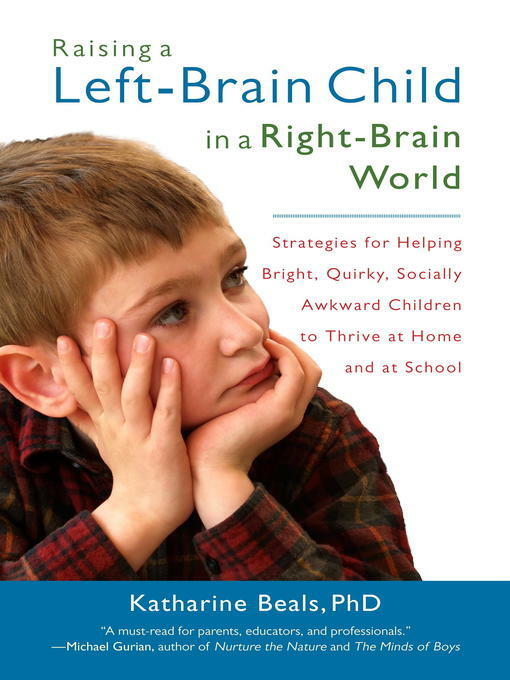 Author Katharine Beals uses the term "left-brain" to describe a type of child whose talents and inclinations lean heavily toward the logical, linear, analytical, and introverted side of the human psyche, as opposed to the "right brain," a term often associated with our emotional, holistic, intuitive, and extroverted side. Drawing on her research and interviews with parents and children, Beals helps parents to discover if they are raising a left-brain child, and she offers practical strategies for nurturing and supporting this type of child at school and at home. Beals also advises parents in how best to advocate for their children in today's schools, which can be baffled by and unsupportive of left-brain learning styles.